Aquaculture system design and finfish aquaculture techniques. Further information about Murdoch can be obtained from Dr. Neil Loneragan at Murdoch or from Drs. Rom Lipcius, Rochelle Seitz or John Hoenig who have all visited the University. 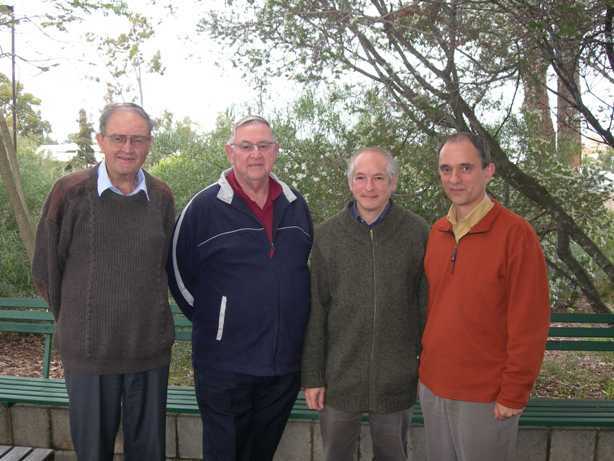 From left to right: Dr. William Hearn from the CSIRO laboratory in Floreat, Prof. Norman Hall from Murdoch University, John Hoenig, and Prof. Neil Loneragan the Director of the Centre for Fish and Fisheries at Murdoch University. 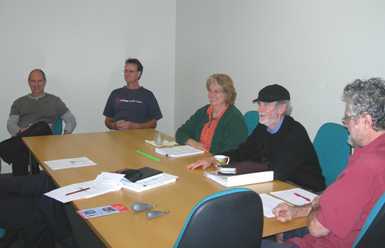 The Perth area offers many other opportunities for research and educational exchanges in marine science. 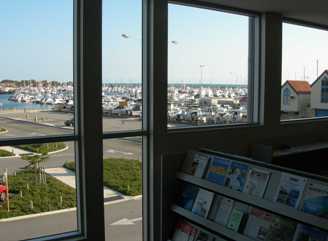 The Western Australia Department of Fisheries moved into brand new facilities in 2005 in Hillarys, just north of Perth. They have strengths in stock assessment of sport and commercial fisheries (including the extremely important western rock lobster fishery, as well as groupers and snappers, elasmobranchs and other fishes), habitat assessment and management, and aquaculture. 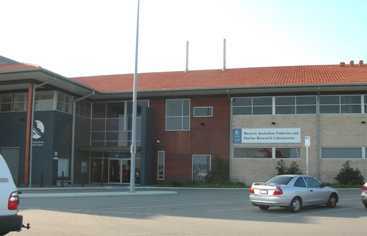 Left: WADF laboratory in Hillarys, Western Australia. Right: view from the library of the WADF laboratory. During a visit to WADF in September of 2007, I participated in a review of research on the efficacy of a method for reducing release mortality of sport fishes. Fish brought up from depth suffer from barotrauma when their swimbladder expands. WADF is examining the use of a "release weight" - a weighted, barbless hook that is hooked through the lip of a fish. The weight pulls the fish rapidly back to the bottom. The angler then tugs on the line to cause the hook to slip out of the lip and release the fish. 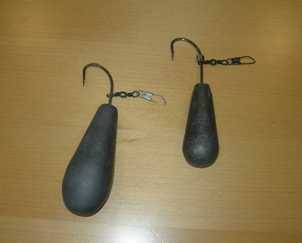 Left: The release weight, a barbless hook and weight used to bring released fish back to the bottom quickly and release the fish. Right: WADF scientists reviewing the data on the efficacy of the fish release weight. 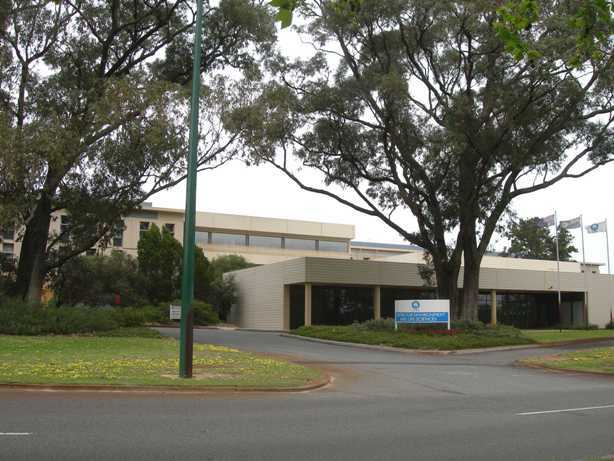 Also north of Perth is the CSIRO (Australian federal government) laboratory in Floreat. It's marine program focuses on physical oceanography, biodiversity, and integrated modeling of the marine environment combining physical oceanography with biogeochemical processes. The CSIRO marine research laboratory in Floreat, Western Australia. Further information about the Western Australia Department of Fisheries and CSIRO laboratories can be obtained from John Hoenig. To see my "gallery" of photos of Western Australia native wildflowers, click here.